Instagram is going crazzyyy with all the spring summer collections by the top designers. One breathtaking collection after another showing up every single day, and today I am going to be sharing my all time favourite designer Abhinav Mishra’s latest collection called ‘sitara‘. Abhinav Mishra Sister of the Bride Lehengas have something for sangeet, mehendi, day wedding and more. Sitara is all about the Indian bride who is unabashedly feminine, carefree and bold. 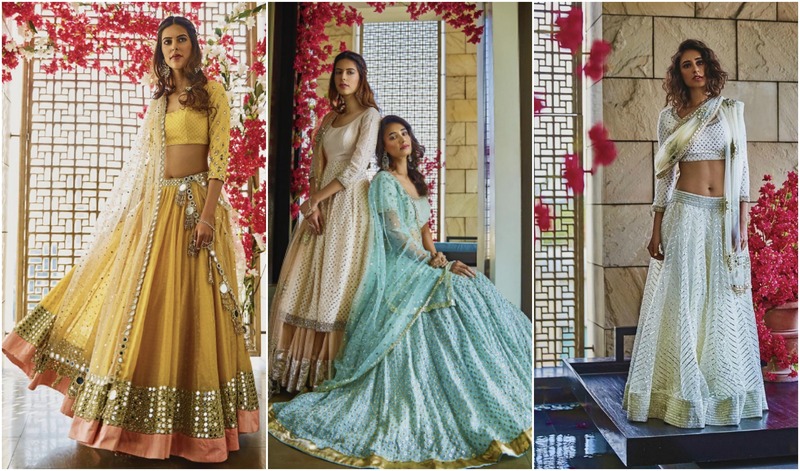 The Abhinav Mishra Sister of the Bride Lehengas spring collection has a splash of colour in earth pastel tones. It is the designers signature colours. But the best part is the sitara or glitter in every outfit. It adds that bit of oomph making it the perfect spring summer pick. For all fellow brides and bride/grooms sisters. I remember last year I had been to his store in Shahpur Jat in search for a lehenga for my sister in law. We entered the store so dreamy eyed, it almost feels like fairyland to any bride and the bridal party. You can’t just pick one and say that’s your favourite. Every single piece in that store is just so magical, and if that was not enough to spin our heads, this sitara collection has truly outdone the previous collections. The outfits have a hint of magic in the form of glitter which instantly adds that pop of romance to the outfit while making it that much more special. Its the perfect summer pick for any bride/grooms sister looking for a wedding day ceremony lehenga, or a mehendi function lehenga. The colours are beautiful in pinks, and off-whites, orange, in mirror embroidery, sequins, gota…I mean crazy options in front of you girls. Like all the best shortlisting your favourite from this one. I can pretty much just look and adore these lehengas like *all day long*. Abhinav Mishra Sister of the Bride Lehengas are so soothing to the eyes, they look feather light and uber comfortable to wear. But what I love most about this new collection is that the lehengas can be reused season after season be it at your best friends wedding, or your sister/brothers wedding, or even as a prewedding function outfit at your own wedding ! Abhinav Mishra Sister of the Bride Lehengas is for all those of you who are looking for a fuss free, light, enjoyable ethnic wear for the upcoming wedding season. Dress it up or down with minimal jewellery and accessories. The best part is all your outfit needs will require you to simply visit his store at Shahpur Jat, Delhi…and then visit some of the neighbouring stores in the same lane for your clutch, earrings, necklace, juttis etc etc and you can pretty much guaranteed walk out of that one market place with your entire look complete. What do Abhinav Mishra Sister of the Bride Lehengas cost?